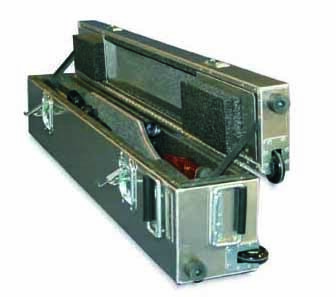 Any shooter who travels knows all too well how rough airline baggage handlers can be on luggage, especially gun cases. So when I fly I want my rifles packed in the best protection available. I've been using Americase's 2-Gun Safari case for about a year, and it's by far the sturdiest and most well-designed airline case I've tried. Made of .080 anodized extruded aluminum and featuring high quality hardware, this case can take a beating. It's not light. At 27 pounds, plus the weight of two rifles, you'll be glad it has wheels. It also has spring-loaded handles on all sides. I especially like the interior design: Both rifles sit side-by side, completely encased in foam, resting upright with no pressure on the scopes. There are two storage compartments inside that work well for bolts, slings, and cleaning supplies — no more digging under the foam to find these small parts. The case is made with a Santoprene seal around the lid that keeps out moisture, dust and dirt. Rifles up to 48 inches long can be accommodated with ease; for longer rifles or rifles with large tactical-style scopes, an XL version is available. When my wife and I flew to New Mexico together last fall to hunt mule deer, the case easily held our two scoped Ruger No. 1s, slings, shooting sticks, basic cleaning supplies and a few other miscellaneous items. When we opened up the case at camp, nothing had moved. All of the hardware on the outside of the case is recessed, making it nearly impossible to have a piece broken off or bent. The latches work with a half-turn to clamp down and seal the case, and both latches can be padlocked. Because of the aforementioned recessing of the hardware, the latches must be locked with fairly small padlocks, as locks with large, thick hasps won't fit through the openings made for the locks. Once you find a couple of locks that fit, just keep them with your case.